Aspinal of London's luxurious flagship store is located in the new prestigious destination of St James's, Regent Street, on the south side of Piccadilly Circus. Our beautiful new House of Aspinal combines the understated warmth and cosiness of an English country home with the contemporary elegance of a London townhouse. The spiritual home of Aspinal is the result of some of Britain's finest craftsmen, stonemasons, cabinet makers, master plasterers and you will see and feel the Aspinal spirit and spectacular craftsmanship in every corner of the store. Each room welcoming you with a stunning open fireplace. 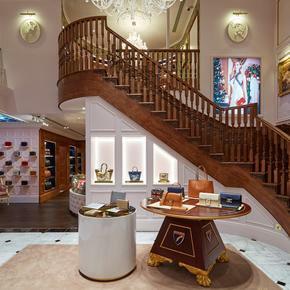 Begin in the magnificent, double-height Ladies' Drawing Room to shop our beautiful sumptuous leather handbags, purses and ladies accessories. And for the gentlemen; relax in our exquisitely panelled men's room and browse our men's business bags, office accessories and travel collections or just opt for a new pair of Aspinal gold or silver exquisite engraved cufflinks from our wide range of affordable beautiful gifts. Climb the sweeping oak staircase and enjoy Aspinal's dedicated concierge service in our stunning members room. We will personalise almost all our smaller accessories and gifts including leather flasks, wallets, journals and a variety of silver gifts and other items. Finally we will exquisitely gift wrap each item with a personal message and deliver almost anywhere in the world in 24-48 hours.